Hurricane Irma was winding down, but Tropical Storm Jose was following close behind. Our spot on Cape Cod near Provincetown, included in the warning area, seemed safe enough, but we knew driving an RV in high wind and rain would not be smart. After some discussion and a bit of research on the availability at our next stop, we decided to leave the Cape and head for the mainland before the storm arrived. We had reservations in two different RV parks. One in the south part of Maine and one in the north. We rarely stay more than a day or two in one location, but this time, there was so much to see, we planned an eight-day stay at two different parks. The first half our stay in Maine began at "Wild Duck Campground". Tucked into a corner of a salt marsh, the campground is planted among towering pines. It is not a large campground, but well equipped and maintained. The owners are a very hospitable couple who stroll around the grounds every evening greeting the campers. Nice touch. It was the setting that first intrigued me. Close enough to the Scarborough Marsh Audubon Center to allow a kayak put-in point inside the campground, and within a short drive of the beaches, towns and harbors. It afforded a secluded atmosphere with in-town convenience. The colors of sunrise and sunset on the marsh reflected a golden palette of tall grass and cattails waving in the breeze. The marsh is tidal in nature, so the water reaches for the small camp road at high tide and then drains away to muddy pools among the grasses at low tide. Either way, the ducks love it. A flock of American Black Ducks appeared each morning on the banks of the pond that edged one side of the road to the camping area. Then, as if on cue, disappeared at dusk. I imagine they had sheltered roosts along the banks of the marsh. Their noisy banter, I call it "quackh-ter" because it sounds like ducks laughing, signaled the start of our day. Arriving late in the day, we spent our first night in camp doing laundry and cleaning the RV. Ten days on the road can take its toll and we needed to tidy up a bit before continuing our adventure. Early the next morning we set out for Kennebunkport, the summer residence of former President Bush's family. It is a cute town but was very crowded the day we visited. I imagine the shops had a very successful day with all the tour buses. Parking is a problem in these high-traffic areas, especially for a 25-foot vehicle. We can park in one space as far as width is concerned, but we need about another half space for the length. Typically, Jim will back it into a spot where the vehicle can overhang a sidewalk or grassy area, that way we only take up one space. This trip, we opted for an empty parking lot six blocks outside of the historic district. The walk to town was lovely, passing old homes and churches, neatly manicured lawns and brimming flowerbeds. The trees were just beginning their fall color change and the effect was stunning. Walking through the downtown was a familiar experience with many of the same shops we had seen in other towns frequented by tourists. We stopped in at the visitors center to pick up a map and talked with the representative there. She mentioned a few festivals scheduled for the weekend and offered a few suggestions for things to see. Yet, the most enjoyable part of the visit was the walk to and from the parking lot, passing all those lovely homes and old churches! 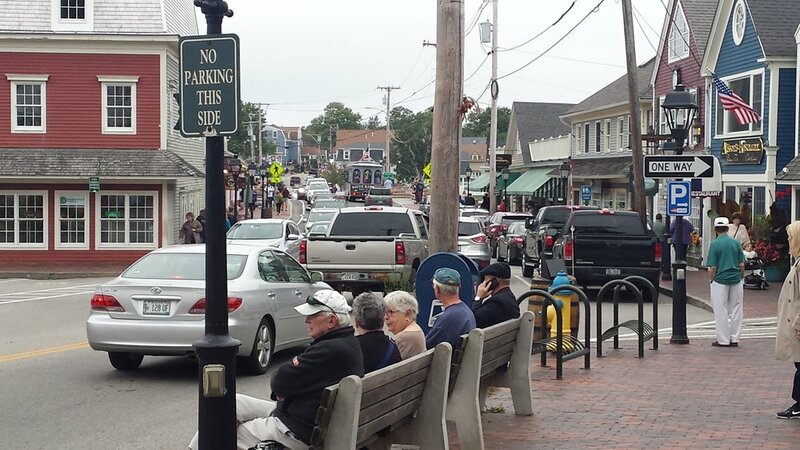 What we discovered on our way to Kennebunkport is that there are many small towns off the tourist radar. Places that invite you to stop and look around. One, in particular, is Biddeford-Saco. Just a few minutes from our campground, the joint community has a great downtown that has not been overtaken with tourist shops. We stopped to talk with the Chamber of Commerce to learn about the history and the obvious, recent development. The representative relayed the ongoing plans for development that included the transformation of the old factory buildings into apartments, shops, and restaurants. The work was well underway and the first phase was already fully occupied. He was quick to point out that, although the development was a new phase in the town's life, Biddeford-Saco had many well-established and successful businesses. One of particular interest to us was a bakery that was over 100 years old. Having grown up in an area where bakeries were part of every town's fabric, we were curious to find and sample this one's wares. Over 100 years old and still delicious! We walked up the hill past all the old factories and down the main street to find "Reilly's". The trek reminded us of walking to the bakery in Atlantic Highlands to pick up hard rolls and crumb cake for Sunday breakfast. Biddeford's bakery had the familiar smell of fresh bread, and we happily purchased a loaf along with a few tempting pastries. Originally, Biddeford's factory island was home to several mills that used the river and falls to power the manufacturing of boots and shoes. For now, it is an enjoyable, authentic Maine town that has embraced its unique identity. We had lunch at "Run of the Mill", a restaurant and brewery in one of the transformed factory buildings. Not the typical lobster rolls here. I had a stuffed squash and Jim ordered a fresh Haddock Parmesan sandwich. We sat on a balcony overlooking the river. It may have once powered factories, but now it acts as a visual invitation to a lovely harbor beyond the old waterfall gates. 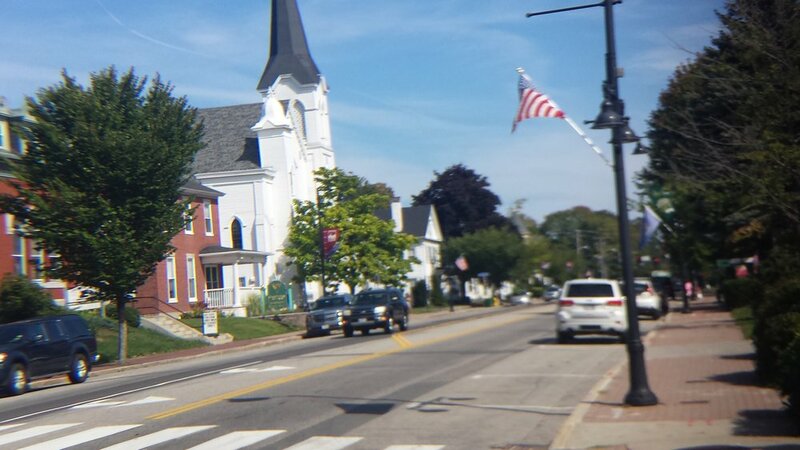 After lunch, we wandered around the other half of the town in Saco. The mixture of storefronts and public buildings exhibited a variety of architectural styles. The main street also offered stately old homes, and clapboard churches that seemed to draw us in. It is a place you can imagine yourself living. Wandering back to camp, we talked about how comfortable we felt in Maine. It felt familiar. That evening, we planned our trip to Portland's waterfront to find a restaurant featured on "Diners, Drive-Ins and Dives", a television cooking show we follow. Portland is only about forty minutes from Scarborough, so we thought getting an early start would give us time to drive around the area, have lunch and then back-track along the beach road. Again, we found that parking is a bit of an issue in these busy areas. Regular business traffic along with tour buses fill the street parking and lots. Finding a spot for the RV was a bit of a challenge. We found an empty lot on the wharf that belonged to a local Marine Trade Association. Jim set out on foot to find some take out while I stayed with the RV in case we needed to move it. The wharf was busy with fishing boats and a coast guard vessel was docking in its slip. I stepped out of the unit to take photos of the boats until Jim returned with news... he had found parking next to the restaurant we wanted to try! Yeah!! So we hopped in the RV and drove about a block along the wharf road to "Becky's Diner". Becky's is a typical local, diner-type restaurant. It was crowded so we sat at the counter rather than wait for a table. Our waitress was friendly and welcoming, getting us started with steaming mugs of fish chowder. Of course, we had to try a lobster roll since we were in Maine, but I am not crazy about all that mayonnaise. Our waitress suggested having the lobster meat with drawn butter instead of mayo. It was perfect! Jim opted for a fresh Haddock sandwich and it was amazing. Great taste, good service, and fun experience. We purchased a couple of chowder mugs as souvenirs of our visit. Our drive back to camp along the beach road was interesting. The season is basically over, so most of the rental cottages and hotels are closed or getting ready to close for the season. We found a side street to park the RV and walked to the beach through a public access path. The gray skies threatened rain, but we took our time strolling the wide beach. A few surfers dotted the heavy waves, while the beach hosted half a dozen people in lounge chairs. A lovely, yet typical beach. The difference was the smell of salt in the air. Much stronger than we have on the Gulf or even on the southern Atlantic coastal areas. This is a cold water salt-air smell, and it is intoxicating. The coastal road winds through towns and neighborhoods with the water just within sight through the trees. We found ourselves back at camp before we knew it. 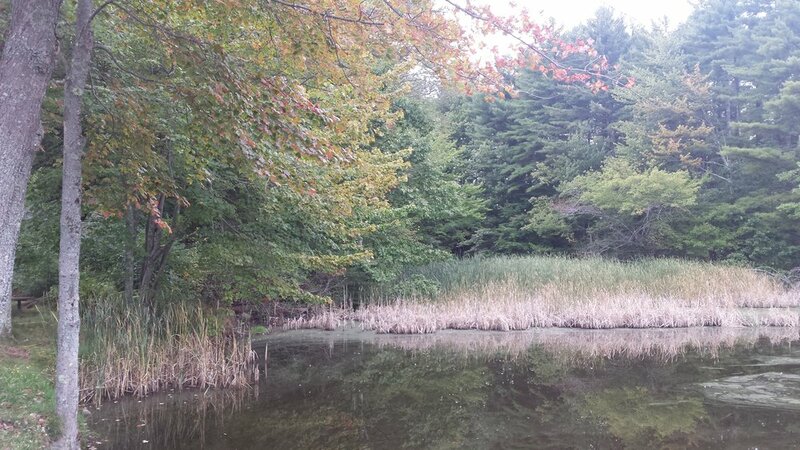 After dinner, we walked around the grounds, admiring the marsh and snapping photos of the changing colors as the sun began to set. We talked with a few of the other campers and learned many keep their units at the campground all year, coming to stay on holidays and weekends. Seemed like a reasonable way to have a vacation home, but we like to travel, see new places and change the scenery frequently. When we mentioned our upcoming trip to Acadia National Park, they waxed poetic about its beauty. We have heard this kind of response for weeks and our expectations began to grow. Could northern Maine and Acadia really be that spectacular? We were about to find out.